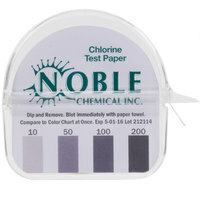 Noble Chemical CM-240 chlorine test paper is the simple, reliable, and economical way to measure the concentration of free available chlorine in sanitizing solutions. This test paper measures concentrations between 10-200ppm (parts per million), with color matches at 10, 50, 100 and 200ppm. The distinct color match at each full unit makes it easy for the user to identify the correct chlorine level. Simply tear off a small strip of test paper, dip into the sanitizing solution, blot with paper towel, then instantly compare the resulting color with the matching chlorine color chart. The paper is held in a convenient, plastic dispensing container. This test's distinct color chart and accurate, reproducible readings give an immediate response for quick and easy use. Test paper is required by almost every health department, and these little strips are perfect for inspections and for routine testing of sanitizing solutions. This is a small product so is best stored somewhere where it cannot easily fall and get lost, such as in a drawer. We use the chlorine test strips all the time!! They are a necessity if you work in food and beverage. Offered at a great price as well! Needed these to satisfy my health dept requirments to test the concentration of my sanitizer. They work as described. Plenty in the roll to last a long time. this test paper is smaller than what i thought, not very long tape, but it has two tape inside the package and it works well. I had to have these to stay compliant with my local health department. These are great for making sure that the sanitizer solutions are the right potency and are easy to use! These test strips are perfect when the health inspector pays us a visit. We always measure our sanitizer, but when we need to show the inspector the levels, these do the trick! The Noble Chemical test strips work perfect for us and save us a ton of money. Before we were using premeasured test strips, they were hard to get out of the bottle and if your hands were wet they would be useless. With these you simply tear off how much you need, test it and you're good to go! This is something you absolutely need to have when the health inspector comes around. They're much easier to use than the ones we had before that you had to peel off a gummed stack. These are very useful for monitoring the bleach levels in sanitizing buckets. They work well but I have tendency to drop the entire unit in the bucket thus destroying it. An essential in any kitchen. The great thing about these test strips is the dispenser. You can easily take rip off the amount you need, unlike the test strips that come in a tube and are all stuck together. I used the strip for the first time today. It's an instant test and I only used about half an inch to test the water. I'm keeping these in a single drawer, the package is tiny and can be easy to misplace. For a product that I am required to have, this is a great price and these work perfectly. Ship time was excellent too! I had them in one day! These are a must have on had for any bar or restaurant. The price is great on these, and they are exactly what you need for your chlorine testers! Nice packaging and dispenser, but unfortunately these didn't work for us. We had to purchase other strips locally in order to pass our health inspection. Thank you for the review! We're sorry these did not work for you. These actually have a two year shelf life. If used after that time, they may be less effective. A Customer Solutions Representative will contact you soon. These are a handy way to check your disinfecting water in a three compartment sink - we keep them nearby, just need to make sure they stay dry. Great dispenser. It's a great size and is convenient to use. The key on the front is helpful and easy to understand. Overall great product! A must have iteam to keep your inspector happy, easy to use and to mention affordable price will be reordering soon to have in my stock. When I decided to switch to chlorine sanitation, I needed a chlorine test strip for testing and these work perfectly. They are a great price and saves me a lot over quats sanitation and strips. This test strip is easy to use and even easier to read. I was afraid that the colors would be confusing but it isn't. I'm glad I purchased them. These little things come in such handy. They're quick and easy to read - you really can't beat them. To top it off, they're not that expensive. Very simple, easy, accurate way to test sanitizer levels. It is a small package, fits easily in just about any spot. I will re-order again when needed. Great product to know our sanitizing water is with in specs. We have many different sanitizing stations and this is very simple and quick to use. The test strips are awsome at testing clorine levels and the size of the strips are so small that it takes no space at all to store. Small size takes up very little amount of room in our storage room and the container is air right - dropped in the sink while trying to test our sanitizer and the ribbon inside was still dry! Small, compact, and easy to use. Simple to understand instructions on the container. Easy to read and something that the health inspector always likes to see. Bought these because I need them to fulfill the State's requirement. Webstaurant.com had the best price and I like them so far. They test the chlorine in the water for dish washing. These are very handy. Our health inspector likes us using these and that makes everyone happy. It is a small package when storing and seems to get mixed up in stuff making it a little hard to locate sometimes but they woke well. These work perfectly for testing sanitizing water. The roll should last for a while and it always keep the health department inspector happy to see them. Health code requires these in our state so it's nice to get them at a decent price. They work well. We will certainly buy again. This test paper is perfect. It is small and fits a fair bit of test paper. An essential tool according to my local health department. These work as they should. The dispenser is a definite plus -- no more trying to fish out tiny test paper strips from a container. Great price too. Works great to pick up chlorine but dont fare so well from tearing. If you are new to test strips, be sure to check with local agencies as to exactly which ones your particular facility is required to have on hand. I couldn't believe the pricing on this product! Amazing and what's more is that it comes with an extra roll of test paper! I love Webstaurantstore's savings! We really enjoyed these test strips. They're very easy to use. They sure do come in handy. We will definitely order more when we need them. These Noble Chemical chlorine test strips do what they are suppose to do which is give an accurate reading. We will probably start using them at home so as to cut down on our chlorine usage. Very effective when trying to determine your chemical strength. I use it once and a while. But it is a must have by any health department. These are very handy to have and I really like the dispenser that it comes in, though it is quite tiny. It is easy to rip off the amount of strips that you need. This is a good price for chlorine test strips. They are handy in the kitchen and I even need to carry them to farmers markets. Fast reacting chlorine test trips. We love the clear, tear off case. This is one lo9ng roll of test strip that you can tear off as long as you like. Much more efficient than the pre cut type. We purchased these strips to check the chlorine and they work really well, you can tear off as much as you need and this saves from waste. Hard to write a review about, but these do the job well. They work well and dispenser keeps the strips in place. I will buy more. Nice product to have in the kitchen and like they are in a dispenser. We leave them above our three bin sink to leave the test strips in for easy access.